450P AED- Standard - SHIPS FREE! 450P AED- Aviation - SHIPS FREE! After cardiac arrest, first responders have a very short window to deliver the lifesaving shock. 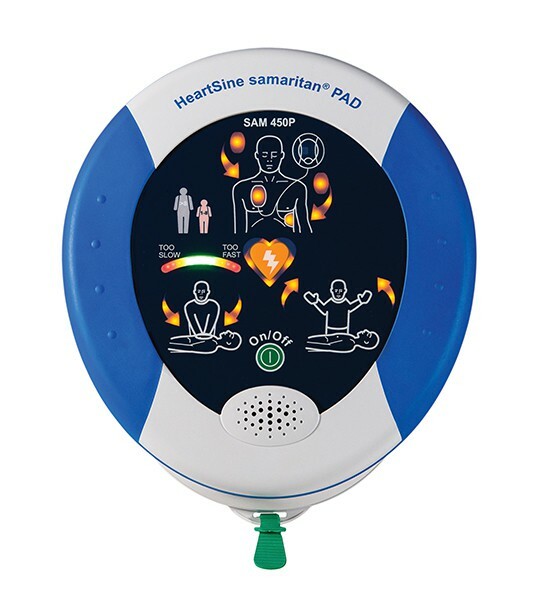 The automated external defibrillator Samaritan PAD 450P has a compact footprint for easy transport, combined battery electrode pads (Pad-Pak™ cartridge) for fast setup and an easy-to-use interface. It's similar to its counterpart the Samaritan PAD 350P utilizing proprietary electrode technology and SCOPE™ Biphasic Technology to assess rhythm and maximize effective shock delivery. The display face indicates when to stay clear, when it's safe to touch the patient, and when to initiate the shock. The 450P goes a step further by providing first responders with real-time visible and audible feedback. Cardiopulmonary resuscitation contributes to an increase of survival rates up to 75 percent. HeartSine created CPR RATE Advisor™ technology that provides verbal prompts "push faster," "push slower," "good speed" to guide the rescuer to the optimal rate of CPR compressions as defined by the American Heart Association. HeartSine leads in innovation with its approach to incorporating the AED electrode and batteries into one single-use cartridge called the Pad-Pak™. This offers significant savings over other defibrillators that require separate units. It also provides fast set-up and only one item to replace after use and upon expiration. It provides up to 60 shocks or six hours of continuous monitoring. The Samaritan PAD emits an audible beep to indicate when batter power is down to ten shocks. The Pad-Pak™ has a four-year shelf-life from the date of manufacture. There are two versions of Pad-Pak™ available for Adults (Gray) and Pediatric (Pink) patients younger than eight years of age weighing less than 55 lbs. 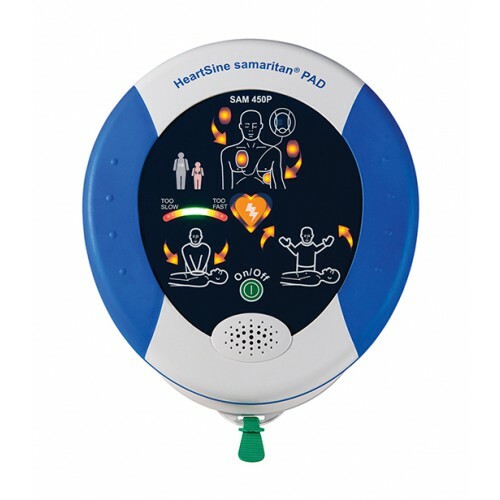 HeartSine also offers Samaritan® Pad 450P- Aviation that provides a safety data sheet for the device to be taken on an airplane showing it's TSA approved. HeartSine Saver EVO™ software can manage defibrillation event data and may be downloaded at //hartsine.com/support/upload-saver-evo/. Using a USB cable, connect to Samaritan Pad computer to download information to print event data and import and export event data. Temporary Transportation Temperature: 14F to 122F (-10C to 50C) Up to Two Days. Unit Must be at Standby/Operating Temperature for 24 Hours Before Use. Samaritan™ PAD 350P: ABS, Santoprene. Printed Circuit Board with Electronic Components.